We all know that the doctrine of the Trinity can be difficult to wrap our finite minds around. There is no doubt that the concept is fascinating and intriguing. But is it okay to explain the doctrine by using a warped, heretical model of it, and then giving a disclaimer of the sort: “It’s kinda like that heresy, but different”? Well, that’s what Lifeway, an entity of the Southern Baptist Convention (SBC) is doing this year at VBS. The 2017 VBS program, Galactic Starveyors, hands out a training manual to volunteers giving advice on how to approach the subject with children who may be questioning. Of course, to orthodox believers, (that is, those who hold to the historic biblical creeds, not the Eastern Orthodox) the doctrine of the Trinity is understood to be essential to the faith–that is, a false understanding could have eternal implications. We worship one God in trinity and the Trinity in unity, neither confusing the persons nor dividing the divine being. For the Father is one person, the Son is another, and the Spirit is still another. But the deity of the Father, Son, and Holy Spirit is one, equal in glory, coeternal in majesty. What the Father is, the Son is, and so is the Holy Spirit. Uncreated is the Father; uncreated is the Son; uncreated is the Spirit. The Father is infinite; the Son is infinite; the Holy Spirit is infinite. Eternal is the Father; eternal is the Son; eternal is the Spirit: And yet there are not three eternal beings, but one who is eternal; as there are not three uncreated and unlimited beings, but one who is uncreated and unlimited. Almighty is the Father; almighty is the Son; almighty is the Spirit: And yet there are not three almighty beings, but one who is almighty. Thus the Father is God; the Son is God; the Holy Spirit is God: And yet there are not three gods, but one God. Thus the Father is Lord; the Son is Lord; the Holy Spirit is Lord: And yet there are not three lords, but one Lord. However, one of the most common heresies regarding the Trinity that we see in the church is what is known as Sabellian Modalism. This heresy teaches that God exists as Father, Son, and Holy Spirit, yet, in different modes, not coexisting at the same time. It denies the distinct personhood of each member of the Trinity. Call attention to the cup of water, the ice, and the steam from the boiling water. Explain that water can be a liquid, a solid (ice), and a gas (vapor/steam). Even though they are three uniquely different states of matter (liquid, solid, and gas), they are still molecularly water (H20). Tell preteens that in somewhat the same way the Trinity is God in three separate states, however water cannot exist in the three states at the same time–but God does. Remind preteens that God, Jesus, and the Holy Spirit have always been in relationship with each other. God created man to share in that relationship. Now, while you might be scratching your head thinking, at least they made an attempt to explain that unlike water, the members of the Trinity do co-exist at the same time, the bigger problem here is the approach. 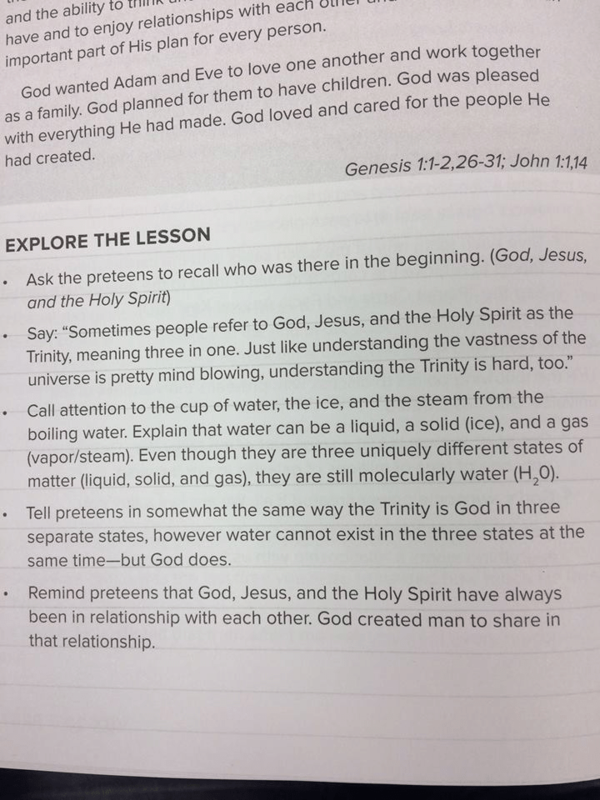 Essentially, they are giving a false, heretical illustration of the Trinity to preteen children, teaching them to think of it in that way, and then adding a disclaimer that the real Trinity is a little different. The reality is that the ice/water/vapor illustration is an exact picture of Modalism. So, as a way to teach children about the doctrine of the Trinity, we first teach them Modalism and then add a caveat to it. Further, the illustration refers to the members of the Trinity, not as persons, as is the historic, biblical understanding, but as “states.” The members of the Trinity are not states, they are distinct, individual persons. The word, “state,” even implies modes, as in Modalism. And to add to the confusion, the members or “states” are referred to as God, Jesus, and the Holy Spirit, instead of Father, Son, and Holy Spirit. Each member of the Trinity is God, yet this usage in this context at best confuses this truth. Bottom line, children are going to be indoctrinated with this illustration and most of them will not have the capacity to discern or apply the attempted caveat, leaving them confused about the truth of the Trinity, and a heretical understanding. If your church is putting on the Lifeway VBS program this summer, it is strongly recommended that you bring this up with the pastors. This is a dangerous way to teach children the doctrine of the Trinity. Has it not crossed their minds at Lifeway that maybe a perfect illustration doesn’t exist for a reason–because God is mysterious and this is a display of His glory? Our finite minds are not meant to fully grasp the concept of God’s nature. It’s part of what makes God so majestic. God has revealed to us in His word exactly what he wants us to know about Himself, and it is of the utmost importance to teach these doctrines completely and soundly but to reduce God’s triune nature to an illustration that has historically viewed as heretical placing its adherents outside of the faith is very dangerous ground to tread.